With The Most Incredible Thing, Justin Peck has been given the opportunity by New York City Ballet to push himself far beyond what he's accomplished thus far in his still young choreographic career. This 45-minute ballet, based on a Hans Christian Andersen fable, is his first attempt at narrative. It has a widely rambling score by the National's Bryce Dessner, and visuals and costumes by Marcel Dzama, and a cast of 56. If it sounds like a lot to keep organized, it is, and that is one of the main issues with this ballet. The format—12 short sections, in accordance with the hours of a clock—are bookended by scenes depicting a competition between the Creator (Taylor Stanley) and the Destroyer (Amar Ramasar) for the Princess' (Sterling Hyltin) hand. As you might guess, each of the 12 dances is (mostly) populated by an according number of dancers; it begins to feel like sitting through the carol "The Twelve Days of Christmas," a checklist of tasks that need to happen for us to reach the end. This isn't to deny observed degrees of invention. Dzama's costumes look rich—creatively, but also cost-wise—with lavish attention to detail. The two-man king walks as if in a three-legged sack race, but then splits in half like a gate to safeguard, or release, the princess. 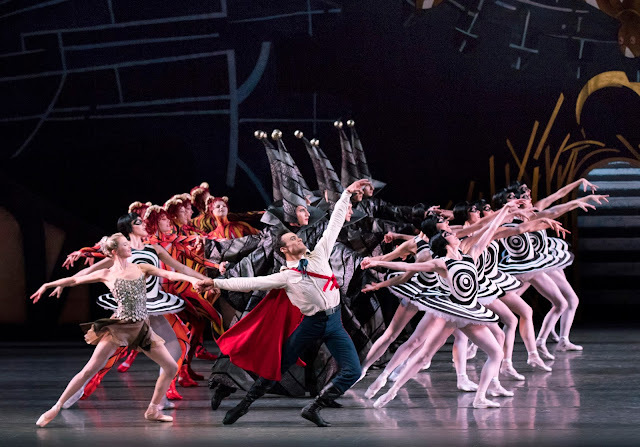 The Cuckoo's wings look like actual feathered wings, although this elaborate costume may have weighed down the spritely and typically steadfast Megan Fairchild (in the cast I saw) as she hammered through the too-rapid allegro steps, at one point slipping. Even birds fall. Oh, about the dance itself, which feels like an afterthought—one of the problems with such an encrusted production. Stanley is perfectly cast, a valiant prince worthy of his dashing red cape, moving with a proud athleticism, sternum forward at all times. As he contracts slightly, his arms cushion pillows of air; he whips his leg in slashing arcs, eating up space. Hyltin's role isn't very memorable, but she pairs well with Stanley. Ramasar, who only appears at the end, has fun with his club, cartoonishly whacking and stabbing any nearby dancer. The three kings carry horse-headed staffs and incorporate them in various moves. 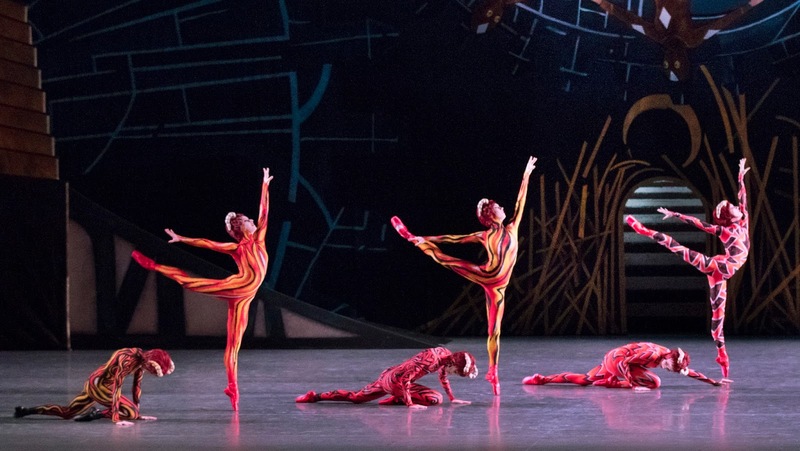 The carnivalesque atmosphere is enhanced by two slides—like you'd find at a playground—down which several dancers enter throughout the ballet. Dzama's painted flats evoke a kind of Weimar-era garish noir; his art is also installed in the Koch's grand atrium, giving the Park Avenue Armory's jarring installations some competition. In recent years, Dessner has experimented beyond his rock band roots into classical and opera-esque evenings, but in Most Incredible Thing, it feels as if he deferred heavily to the movement and visuals. Surging chords and xylophones, medieval clarinet lines, mellow, lyrical swells, Glass-ian shimmers, and propulsive beats are thrown in the overwhelming mix. It didn't help that the premiere capped an already long evening of last year's fashion gala premieres plus Chris Wheeldon's 2010 Estancia, as much musical-theater as dance, and indicative of his now proven sure hand at Broadway.